San Francisco Bay Area world music underwent a transformation in the late Sixties with the founding of the region's first percussion ensemble. The national origin of the music played was Japan. The style was called "taiko." 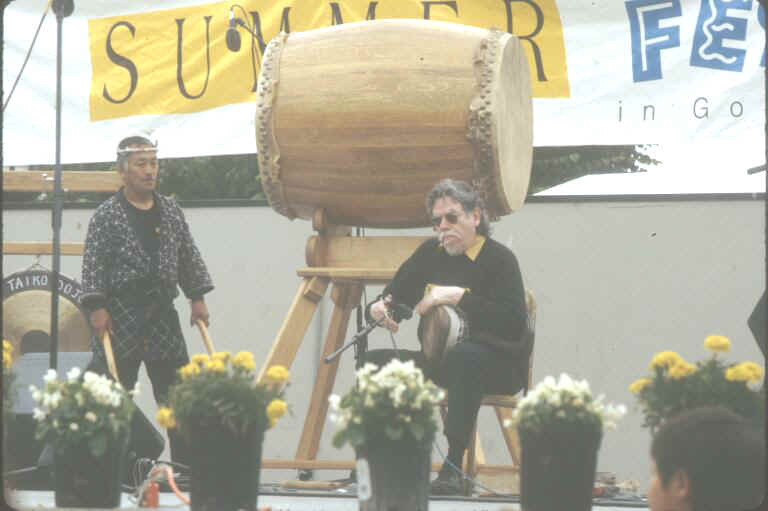 The figure central to this pivotal development was the City's Seiichi Tanaka, who later went on to directly or indirectly play a part in the formation of some 26 taiko groups throughout the United States and Canada.. Tanaka's importance to Bay Area world music community, however, reaches deeper than his role in the development of a widespread network of taiko ensembles. Prior to the 60s, world music had always enjoyed a strong presence throughout the Bay Area. But the various strains tended to be compartmentalized within specific communities Cantonese opera took root and grew in the Oakland and San Francisco Chinatowns. The Irish enjoyed set dancing at halls in the Mission District. Russian Orthodox choirs remained in the Avenues. Cajun bands played principally in Richmond, Hunter's Point and East Palo Alto. With the formation of San Francisco Taiko Dojo, Tanaka opted for his own policy of openness and, perhaps unwittingly, put into place two key "rules" that came to permeate the local cultural setting in which world music now thrives so vigorously. Rule number one: assimilation now includes preserving and extending one's traditional heritage. Rule number two: interest in a particular art form, rather than an ethnic identification with the culture from which it arose, becomes the main criteria for eligibility to study the form. The formula proved to be one of success not only for the fledgling Taiko Dojo, but also, as described below, contributed significantly to a revival of taiko in Japan as well. In the years that followed, the principles espoused by Tanaka came to be reflected in numerous other ensembles and troupes. Granted, given the late 60s, much of the Bay Area's music and dance community was already drifting in the same direction. But there's little question that Tanaka was the one who got there first. WBR: Is there a discernible point in history in which taiko drumming emerges? TANAKA: Nobody knows when taiko first emerged. It is known that in the beginning, taiko was basically asking for rain. The drums imitated lightening making the sound of thunder. In the summer, when the farmers needed rain, they prayed, asking for rain, and played taiko. People believed that the god of rain, of thunder, would respond and bring rain to their fields. Taiko was for rain, then for harvest. Also, for fishing villages, for a rich catch. Taiko traditionally has been very much connected with daily life. It is also connected to life religiously; drumming and singing together can be a prayer. Also, taiko can be played with a feeling of Awhen I play, I see people gathering, and I see who I know. @ There is a lot of taiko at festivals with that kind of feeling. WBR: Can you describe briefly some of the regional styles? TANAKA: Suwa Taiko is one of the very, very oldest forms of taiko, formed 400 or 500 years ago. Then there is from the 16th century, Gojinjo DaikoCAtaiko@ and Adaiko@ mean exactly the same thing; the only difference is how they=re pronounced. This came from a fishing village on the Noto Peninsula facing Japan=s seaside. The drummers wear wooden masks with dry seaweed for hair. The reason why is, in feudal war time, the warlord=s soldiers came to attack the fishermen=s village. The fishermen had no weapons, nothing to fight with. This was a time of belief in demons. The fisherman thought of making masks with furious expressions, like demons, using seaweed for hair, and playing taiko in a very dynamic fashion. When the soldiers were sleeping at night, 10 or 20 people beat the drums. The soldiers were frightened by the drumming and the appearance of demons. They left and never came back to the village. So the drumming saved the villagers. Since then, those people have continued to play the drums and wear the masks that saved their lives. For 450 years, the men have handed down to kids the tradition of that furious, dynamic style of taiko. Another taiko style is AHachijo Daiko@ from Hachijo Island, near Tokyo. The village people there also lived by ocean fishing, which traditionally has been done only by men. Only women and older men are left in the village. So many women played taiko, asking for safe sailing and for the catch. Taiko played by women is very unusual and women on Hachijo Island have played for hundreds of years. Their style is more rhythmic, and they sing and they pray. There is Osuwa Taiko. This is taiko imitating thunder, asking for rain. It is found in the high mountains in Japan, which are called the ARoof of Japan,@ because the elevation is very high. In summer, the thunder is tremendous: a big, dynamic sound. The farmers imitate that thunder in their taiko, to bring the rain. TANAKA: Sukeroku Taiko is one of the modern, creative taiko groups formed in the 60s in Tokyo. They start to play taiko not only on one drum but on two drums at the same time. Then also drum to drum jumps and dancing; lots of action and lots of modern beats. They were the first group to use slanted stands (ASukeroku stands@) at an angle to create new music, movements and styles. But there are many other styles of taiko, within each prefecture in Japan, and even within families. WBR: Were you born in Japan? TANAKA: Yes, in Tokyo, in 1943. The war had started, so I moved to the country to the Nagano Prefecture, in the ARoof of Japan@ region. After a few years there, I first heard the drumming of Daihachi Oguchi. He=s very important, the main person for making taiko popular. When I was young, taiko was fading away as a festival relic. 30 or 40 years ago, Japan rediscovered taiko. I was under ten years old when I first heard Mr. Oguchi=s taiko drumming. I was just amazed. We had a taiko group in my own town, but it was very simple. His music was like thunder sounds, very dynamic. Mr. Oguchi=s taiko was a taiko orchestraCall different sizes of drums to make taiko harmony. It was very impressive. It touched my heart. WBR: Did you attempt to become his student? TANAKA: Not then. I was too shy to ask. Actually I wouldn=t have been accepted then because I was from a different family. Teaching was kept within families, or with district people. But otherwise the regional taiko was kept exclusive. Throughout Japan, taiko styles were kept within their separate districts. They were pretty exclusive, almost like their sacred art forms, and only practiced by their particular village people, by district people, within. Mr. Oguchi was never my teacher before I started taiko here in 1968. At the time, the United States had frontier spirit. It was very dreamful, this country. In 1967, I saw the San Francisco Cherry Blossom Festival and it was without taiko. So I thought I should do it. That=s the reason I started. 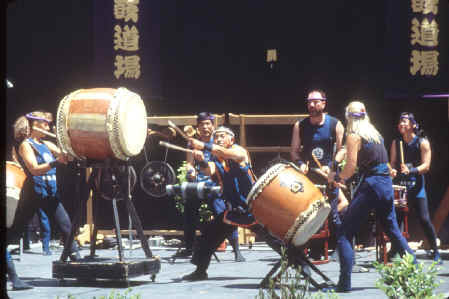 I believe that my Taiko Dojo was the first percussion ensemble to form in the Bay Area and North America. WBR: Did you have any formal training in taiko prior to that time? TANAKA: No. I had some coaching from my town, but not at a professional level. When I started I was beating just one drum. Then the action got so big. Many people in San Francisco wanted to learn taiko. And I needed more skill to organize taiko orchestrally. Then I went back to Nagano and asked Mr. Oguchi to teach me. WBR: How did he respond to your request? TANAKA: He couldn=t teach me officially, because his family did not agree to teach outsiders. So he taught me very secretly. He really read my spirit, my enthusiasm for taiko. He was very happy. I learned very quickly. He was very helpful from the very beginning. Then soon after I was his student, Mr. Oguchi opened up his sacred art form to the public. He taught more than a thousand groups in Japan. He is now Grand Master Oguchi. So I=m a legend among those thousand groups in Japan, because I was the first one. I opened that gate. And I am the first student to take the art form outside Japan. WBR: That openness has carried over to your own troupe. Hasn=t San Francisco Taiko always represented a very mixed group of cultural backgrounds and genders? TANAKA: Any people. I open the door to any people. The entrance is open. The exit is open too. I give an equal chance to everybody. They take it or not; it=s up to them. WBR: A taiko orchestra will have a variety of drums. Can you describe some of them? TANAKA: The biggest drum is called Oh Daiko. It is three feet deep and five feet in diameter and is made from very heavy wood. An Oh Daiko can weight as much as a ton. The Miya Daiko is a shrine drum, with an average diameter of about one foot, six inches and a depth of one foot, eight inches. It is a very popular taiko drum. Another drum is Okedo. It has a barrel shape. It is put together like a barrel and tied together with rope. The Shime Daiko is a smooth head, snare-drum type instrument. It has a high-pitched tone and is used to keep the basic rhythm. Then we have a special Acanon@ drum, made out of three different sizes of pipe, keeping bass rhythm. Bell drums and bamboo flutes may also be used with taiko. WBR: Is there any general size of a taiko group? TANAKA: No. Taiko can be played with one or two people. Or, there is one group in Japan known as Shinyo Daiko, which has a full orchestra with a choral behind. Sometimes, there will be 500 individuals in the drum orchestra and chorale together. So taiko can be played by one to 500 people. WBR: Ok, back to San Francisco. You opened Taiko Dojo to immediate success. Did you always plan to assist in opening additional schools? TANAKA: No, but I was at the frontier. Many people started troupes after hearing taiko and they needed instruction. I wanted to make taiko as popular as possible, because taiko is a good art form. So I went wherever I was wanted as a teacher: San Jose, Los Angeles, Chicago, New York, Seattle, Vancouver, Montreal, Denver, Sacramento, Alaska, Florida, Texas..
WBR: Are most of these schools still active? TANAKA: Yes, and they=re very good. When they began, they also had frontier spirit. Taiko was very new. People were taking chances, because they couldn=t know if their troupes were good or bad. But today they are still active and they=re more impressive than taiko groups in Japan. For the most part, they make their own drums. I=m really proud of them. This is not only my own view. 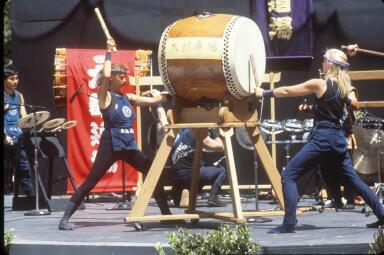 In summer 1990, Taiko Dojo toured Japan, ten different performances in one week. They saw the way my students took care of their drums. The way they behaved. People were looking at olden time Japan. WBR: Did you have the Rising Star children=s classes when Taiko Dojo first formed? TANAKA: No, that began in 1992. So now we have a children=s class, when they started maybe they were six years old, seven years old, those people are in their mid teens, 15, 16, 17. So it is strong now, a very strong group. WBR: And, roughly, how many students does Taiko Dojo have at any one time? TANAKA: Included from all different classes, maybe 200. We have classes at our Dojo in South San Francisco and at the San Francisco Buddhist Temple. WBR: And do you still have six and seven-year-olds joining the school? TANAKA: Oh yes. We have a children=s class, a beginner=s class, so we have lots of new kids coming. Six years old, seven years old, eight years old. I hope another strong dynasty for Taiko Dojo comes in the next couple of years. The first Rising Star kids are now very tall. So if they keep with me, they will be very good and their taiko will be good, because they are very, very genuine taiko drummers. WBR: For many years, Taiko Dojo was also involved in a Napa State Hospital program intended to encourage rehabilitation of young people with severe problems. How did that come about? TANAKA: In 1991, we were selected by the California Arts Council as part of the Arts in Mental Health program at Napa State Hospital for students from elementary, junior high and high school, twice a week, five hour days. They were mostly emotionally disturbed kids. Some were criminal. They were there by court order, those kids. It was very, very successful, but the first six months I suffered, because I didn=t know how to do it. I had a very, very hard time. In the beginning I tried to teach but those kids were totally against it. Kids never listened. They didn=t like it. Whatever they liked, they did it. So I said, I just give them a lecture or demonstration, forget about playing with them. Then I changed direction. After we got to know each other, we just played together. Not as teacher and student. We were just the same as human beings. People played the drum as hard as they wanted. Then they totally changed. The kids opened their minds and played with me. Very successful. After class, they became wide open, shining. Very positive feelings. When I went to Napa, they told me not to get closer than six feet to the students. Stay away as far as possible, so if something happens, you have time to run away. But my style of teaching is skin to skin. I have lots of body touch. So I got closer than one foot. Even with those people who killed their parents, not exactly a very safe and comfortable situation. I really don=t care. To me, person to person, no matter what his or what her past life. Right now, we are just taiko drummers. So I got as close as possible and we played together. Everybody trust me. Everyone was nice to me. Nobody bothered me. Nobody hit me. Nothing. To me, I just go in, go into them, into their hearts, into their character, instead of staying out. That was very successful, quite an experience. We=re still teaching in Napa, but the school is closed so we=re not teaching kids, just adults. And now my students are doing the teaching because I=m getting much, much busier. WBR: In addition to a Askin to skin@ style of teaching, you also have a distinct philosophical approach to taiko that you describe by the words Akarada,@ Akokoro,@ Awaza,@ and Arei. @ What do those words mean? TANAKA: This is based on martial art philosophy. AKarada@ means the body and physical strength. AKokoro@ means the heart. AWaza@ is skill. And ARei@ is courtesy. These are the four elements of the Taiko Dojo policy, the Tanaka philosophy. No other taiko group follows this, that taiko is still active, living, with people respecting each other. We=ve already moved far from taiko festival music, and my goal is to continue with new challenges, creating new sounds. Now, I am train myself. I don=t compare myself to any other people. I just maintain my health and condition and I want to play. I will keep moving until my life ends. Some mornings I=ve done two hours of jazz dance. My taiko blends martial arts, music, and dance together. So it stands out. Very different. WBR: As a performer, where outside the taiko mainstream have your efforts taken you? TANAKA: I=ve played with numerous jazz musicians, Art Blakely at San Francisco=s Keystone Korner more than 20 years ago, Max Roach, Eddie Marshall, Airto, Herbie Hancock. I once performed with The Temptations at the Miyako Hotel. Very unusual. I=ve recorded with a hard rock group called Shark Bait. Every time they performed, they broke television sets on stage. Taiko Dojo has also performed with the Rova Saxophone Quartet and with Mario Bauza and Tito Puente. I=ve worked on movie soundtracks, for Francis Coppola on Apocalypse Now, which I worked on with Mickey Hart and Zakir Hussain; for George Lucas on Return of The Jedi, and for Phillip Kaufman on The Right Stuff. Kaufman also asked me to do Rising Sun. I respect him. He=s such a fine person. Michael Creighton, the book=s author, said that Japan was passing. That=s what a lot of people said. I read the book in both Japanese and English. I thought this was a good warning for Japanese business people who have a very tall nose, big face, too much. And look now. Japanese economy is so down now. The book by Michael Creighton was a warning. So I thought that taiko music with this movie is good for taiko, because many people watched the movie, in Africa, South America, everywhere. WBR: Taiko Dojo has toured extensively for its entire history, throughout the United States, Japan, throughout Europe, to Germany with the Rova Saxophone Quartet, Cuba, Israel. Could you share something of the Cuban and Israeli tours? TANAKA: Cuba was in 1998 for the Japanese Centennial ceremony, their centennial of Japanese immigration to Cuba. 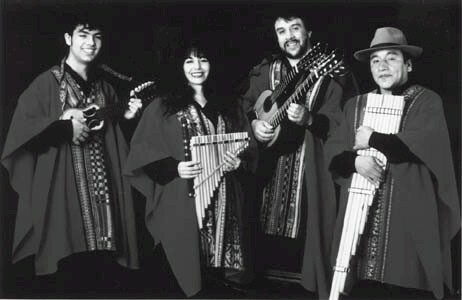 In Japan we have a very famous Latin band called Caribbean Breeze, which used to be called the Tokyo Cuban Boys. Right after the wartime, they introduced Cuban music to Japan. Maestro Tada aki Misago, he went to Cuba to study and introduced Cuban music to Japan in the 1940s. Nowadays, Cuban music is very popular in Japan, but at that time not so popular. So for the Centennial, Taiko Dojo joined members of Caribbean Breeze in Cuba. We toured for two weeks. We had a special ceremony for the Centennial. We also went to the graveyard for Japanese immigrant ancestors for a dedication ceremony. For me, it was the first time I went to a socialist country. I was really impressed with their music and their passion. For them to play music is very, very natural. I was very, very impressed with their music, but more than their music, their life. For them to play salsaCwhatever musicCis part of their total life. An impressive, beautiful country. WBR: And Israel? Did any of your students go to Israel with you? TANAKA: Oh yes, myself and four students. Four Japanese and one Caucasian, a lady from Stanford University. Everywhere, people thought the Caucasian woman was not part of our group. There=s a city called Haifa, with the Ticotin Museum, a Japanese art museum, the only one in the Middle East. In 1995, they were having a reopening ceremony for the museum. They asked a Japanese taiko group to participate. However, in December, Japanese taiko groups usually are very busy. Nobody was able to go. So the Israeli embassy in the United States called me. Maybe you don=t know this story. In World War II, a Japanese Consul-General, Chiune Sugihara, provided visas to save Lithuanian Jews from the Nazis. He saved several thousand people. He wrote hundreds, hundreds, thousands of visas by hand, against Japanese government policy. Because at that time Japan and Germany were friendly countries and Japan had to follow what the Germans said. But according to Sugihara=s humanity, he decided, I should write visas to save these people. People were outside the building waiting their turn. Even in train. After his duty in Europe, after his return to Japan, the government took his position away, because he acted against it. But the government was wrong, he was right. That the government admits. Finally, his honor. What he did was quite a good thing. Now they have to recognize what he did. For humanity. I am very, very impressed with that story. His wife came to the United States to tell what happened and spoke at San Francisco auditorium. Then I performed. The Israeli embassy people remembered me. So they called me: Are you able to go to Haifa? Ok, I go. Israel is a pretty far country from here. So I have a chance to go to Israel. It was quite an experience. We went in December 1995, the year Prime Minister Rabin got ambushed. We experienced Chanukah. I went to the square where Prime Minister Rabin was killed. Lots of candlelight; I prayed for him. Then I went to Jerusalem, the Wailing Wall. Israel was such a far country before, but now I feel so close. Israel and Japan are very alike. Both countries are small, with few natural resources. A very ceremonial people. The parents work so hard; the kids study. I found out. I had a lecture for kids and their parents. They asked me such hard questions: how to get chi energy, or keep power. So many questions. WBR: Taiko Dojo=s history has also been characterized by collaborations with artists from a wide variety of world music traditions, as well as by appearances by these artists at the annual International Taiko Festival that you founded in 1986. The roster includes the Brasilian Omulu Capoeira and the Andean music group Sukay. 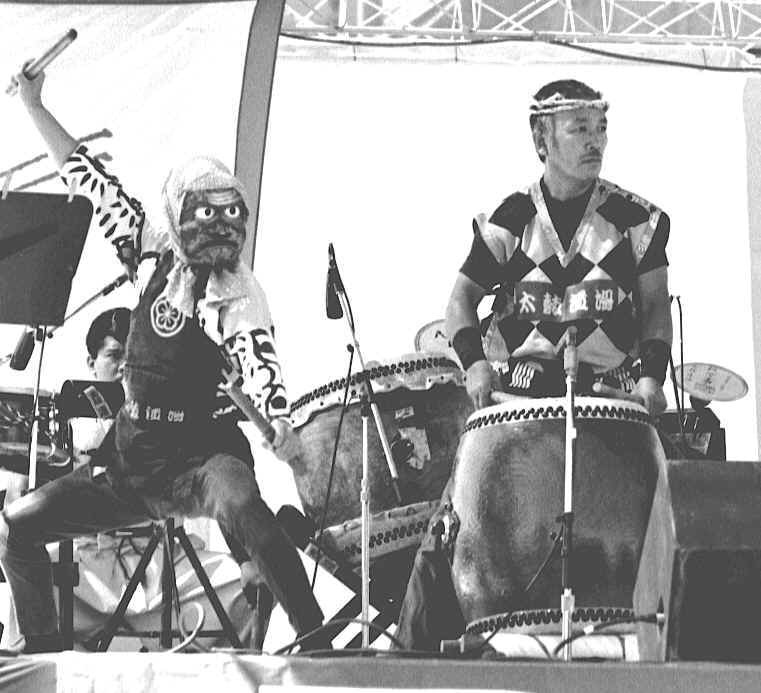 TANAKA: Taiko Dojo collaborated in 1995 with Omulu Capoeira in Dancing Thunder, a two-hour concert program. Omulu Capoeira is led by Mestre Preguiça, a master from Brasil. Capoeira is a Brasilian martial art with dance and music. Then, I=m a master from Japan. I think we both learned something and we enjoyed our collaboration. We didn=t collaborate with Sukay. They performed at our International Taiko Festival concert at Zellarbach Auditorium. I invited Sukay because I like their music, Peruvian music. A beautiful sound. Actually, I played with a Japanese koto musician, going to Europe and Mexico in the 1970s. We played a Latin number in Mexico, El Condor Paseo. Peruvian music, very memorable. So I invited Sukay to the International Festival. And I=ve played with Zakir Hussain, the tabla genius. WBR: Does Taiko Dojo still tour Japan every few years? TANAKA: Every year!, a couple of times. I=m just back from my home town, called Tatsuno, in Japan, Nagano Prefecture. Last year my father died and I went to his funeral. All my old friends and I got together. They said we need a Seiichi Tanaka home-town first concert. So they volunteered to prepare for one whole year. In June 2000, I performed my first home-town concert. More than 1200 people came for a 700-capacity theater. All my friends, all my classmates, everybody gathering to celebrate together. We also donated to a senior citizen=s home. Everybody donated their time to make this concert. It was very successful. WBR: How do people in Japan respond to taiko from the United States? TANAKA: Yes, it=s almost the reverse of import/export. Right? This is a question I always ask people. I taught the Kijima Daiko in the Nagano Prefecture of Japan. They came to San Francisco for the Cherry Blossom Festival. They did not think that in the United States there would be any good taiko drummers. But they saw Taiko Dojo: totally culture shock. So after that they asked me, would you please come to our village to teach Japanese people taiko from the United States? So I went to the village and gave a lecture and demonstration. After their graduation from high school, two young men from the group came to the United States to study taiko from Taiko Dojo. They stayed here for four years. They studied English and taiko. Then they went back to Japan and one became a teacher of taiko. In my teaching I am very, very old-fashioned. I believe in Confucianism, in the respect for elders. Seniority is very important, too. So, we went to Japan. All my students greeted others so well, very polite, with courtesy. Most people in Japan see in Taiko Dojo what they have lost. They learn something from my students: what they have lost. And the respect. Not only the respect to the teacher or master, or dojo (practice place or space). But also the drum, the drumstick, the skin, the animal who died to provide the skin; they show appreciation. I live in such a small apartment still, after 32 years. But my garden, the whole United States I think of as my garden. People usually take care of their own garden, but who cares about other people=s garden? But we should keep Nature clean, trees green. People should live with Nature. Nature=s power I get from the sunrise, in the nighttime moonlight, to my body. Also I do Chinese exercises called Chi Gong. All Mother Nature=s power comes down into my body. So I=m strong now. I do breathing exercises. I=m always getting power from trees, rocks. So we=re all together with Nature. Again, Confucianism: appreciation, respect.